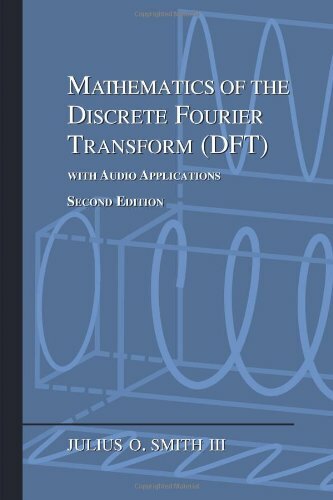 In this section the main Fourier theorems are stated and proved. 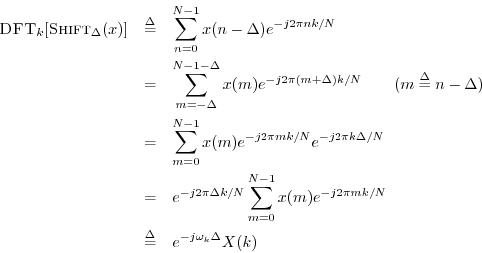 It is no small matter how simple these theorems are in the DFT case relative to the other three cases (DTFT, Fourier transform, and Fourier series, as defined in Appendix B). 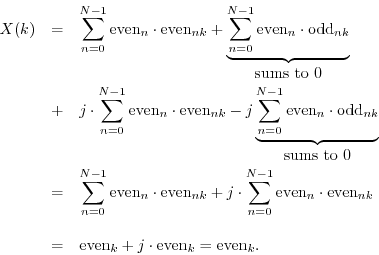 When infinite summations or integrals are involved, the conditions for the existence of the Fourier transform can be quite difficult to characterize mathematically. Mathematicians have expended a considerable effort on such questions. By focusing primarily on the DFT case, we are able to study the essential concepts conveyed by the Fourier theorems without getting involved with mathematical difficulties. Definition: The property is called Hermitian symmetry or ``conjugate symmetry.'' If , it may be called skew-Hermitian. The shift theorem says that a delay in the time domain corresponds to a linear phase term in the frequency domain. More specifically, a delay of samples in the time waveform corresponds to the linear phase term multiplying the spectrum, where .7.13Note that spectral magnitude is unaffected by a linear phase term. That is, . where . A positive time delay (waveform shift to the right) adds a negatively sloped linear phase to the original spectral phase. A negative time delay (waveform shift to the left) adds a positively sloped linear phase to the original spectral phase. If we seem to be belaboring this relationship, it is because it is one of the most useful in practice. In practical spectrum analysis, we most often use the Fast Fourier Transform7.15 (FFT) together with a window function . As discussed further in Chapter 8, windows are normally positive ( ), symmetric about their midpoint, and look pretty much like a ``bell curve.'' A window multiplies the signal being analyzed to form a windowed signal , or , which is then analyzed using an FFT. 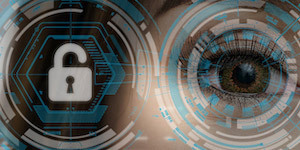 The window serves to taper the data segment gracefully to zero, thus eliminating spectral distortions due to suddenly cutting off the signal in time. Windowing is thus appropriate when is a short section of a longer signal (not a period or whole number of periods from a periodic signal). Theorem: Real symmetric FFT windows are linear phase. Proof: Let denote the window samples for . Since the window is symmetric, we have for all . When is odd, there is a sample at the midpoint at time . The midpoint can be translated to the time origin to create an even signal. As established on page , the DFT of a real and even signal is real and even. By the shift theorem, the DFT of the original symmetric window is a real, even spectrum multiplied by a linear phase term, yielding a spectrum having a phase that is linear in frequency with possible discontinuities of radians. Thus, all odd-length real symmetric signals are ``linear phase'', including FFT windows. When is even, the window midpoint at time lands half-way between samples, so we cannot simply translate the window to zero-centered form. However, we can still factor the window spectrum into the product of a linear phase term and a real spectrum (verify this as an exercise), which satisfies the definition of a linear phase signal. 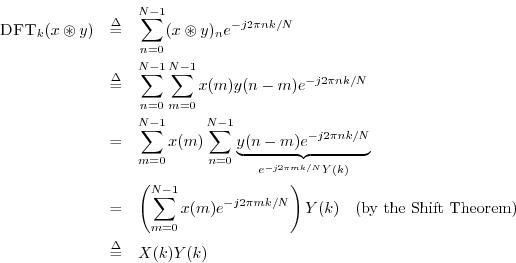 Proof: The steps are the same as in the convolution theorem. This theorem also bears on the use of FFT windows. It implies that windowing in the time domain corresponds to smoothing in the frequency domain. That is, the spectrum of is simply filtered by , or, . This smoothing reduces sidelobes associated with the rectangular window, which is the window one is using implicitly when a data frame is considered time limited and therefore eligible for ``windowing'' (and zero-padding). See Chapter 8 and Book IV  for further discussion. Thus, , and by the modulo indexing of , copies of are generated as goes from 0 to . where was defined in Eq. (7.4), followed by the definition of . where zero padding is defined in §7.2.7 and illustrated in Figure 7.7. In other words, zero-padding a DFT by the factor in the frequency domain (by inserting zeros at bin number corresponding to the folding frequency7.21) gives rise to ``periodic interpolation'' by the factor in the time domain. It is straightforward to show that the interpolation kernel used in periodic interpolation is an aliased sinc function, that is, a sinc function that has been time-aliased on a block of length . Such an aliased sinc function is of course periodic with period samples. See Appendix D for a discussion of ideal bandlimited interpolation, in which the interpolating sinc function is not aliased. 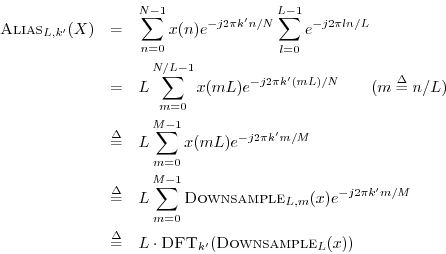 Periodic interpolation is ideal for signals that are periodic in samples, where is the DFT length. For non-periodic signals, which is almost always the case in practice, bandlimited interpolation should be used instead (Appendix D). In other words, ideal periodic interpolation of one period of by the integer factor may be carried out by first stretching by the factor (inserting zeros between adjacent samples of ), taking the DFT, applying the ideal lowpass filter as an -point rectangular window in the frequency domain, and performing the inverse DFT. The last step is provided by the zero-padding theorem (§7.4.12).